Crossroad Knits: Watch Out, Liz! 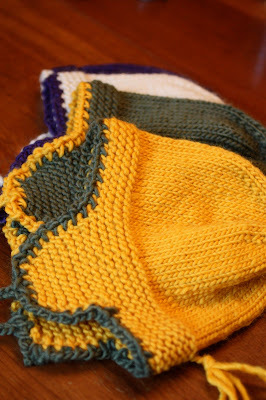 There are some hats coming your way for Project Nepal! I spotted this pattern on Grumperina's blog. 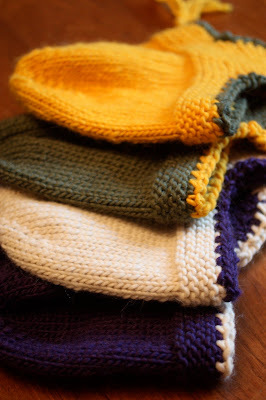 The hats were extremely fast and fun to knit. One hat took me about a football game and a Daily Show episode. Yarn: Lamb's Pride Bulky (one skein is enough for a medium hat with leftovers for trim): Old Sage, Wild Mustard, Aran, Clemetis. Send your warm, wooly goodies to Liz by the 25th! Those are great! I really wish that I would have looked at the previous post about sending these to the children of Nepal! I won't be able to make some in enough time to get there by the 25th...grr. dang it, ann, once the knitting bug found you again, it just won't let you go! nice hats! we montco SnB ladies just gifted liz with some special items too. keep on churning out the luv! ditto what Katrina said. could we send a second batch?